It’s been a really rough winter here at the Reeve house. Since the start of the season, I’ve had a nasty stomach bug, pinkeye (on Christmas Day for Pete’s sake! ), a sinus infection, and an upper respiratory infection. Adam has had this horrible sounding cough since mid-December, and despite currently being on antibiotics for it he is more congested than ever. The baby had a mild bout with the stomach bug (I think I was exposed to it through her), and she has been teething like a fiend the past week–with 4am wake-up calls to match. 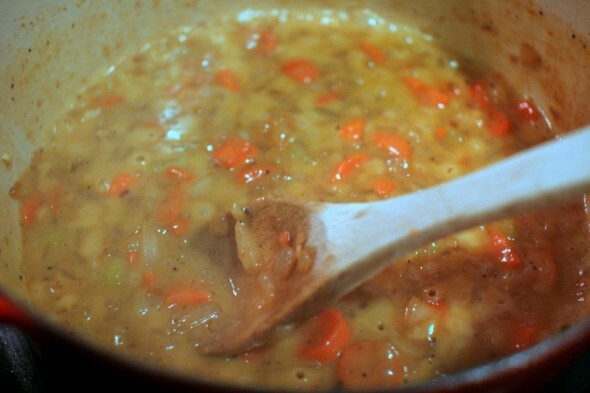 I may make this again very soon just to carry out my plans for soup. Fry chicken, turning once, until golden brown on both sides, about 10 minutes total, and transfer to a plate. Stir in flour, and cook until flour is absorbed by vegetables and is no longer visible, about 1 minute. 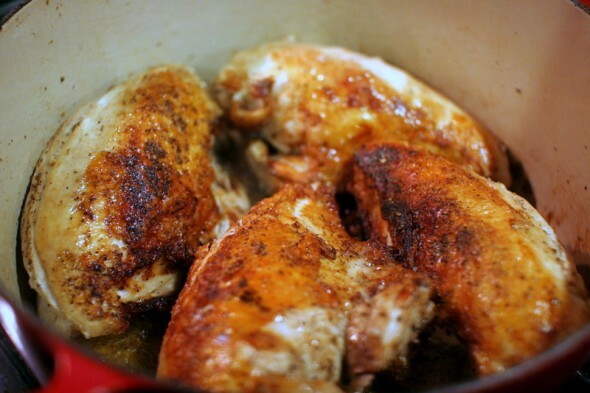 Place chicken, skin side up, in a single layer on vegetables; pour juices that have accumulated on plate into pot. Tie parsley sprigs, thyme sprigs, and bay leaf together with kitchen twine (I didn’t have any twine, I just had to fish them out afterwards–no big deal); add to pot. 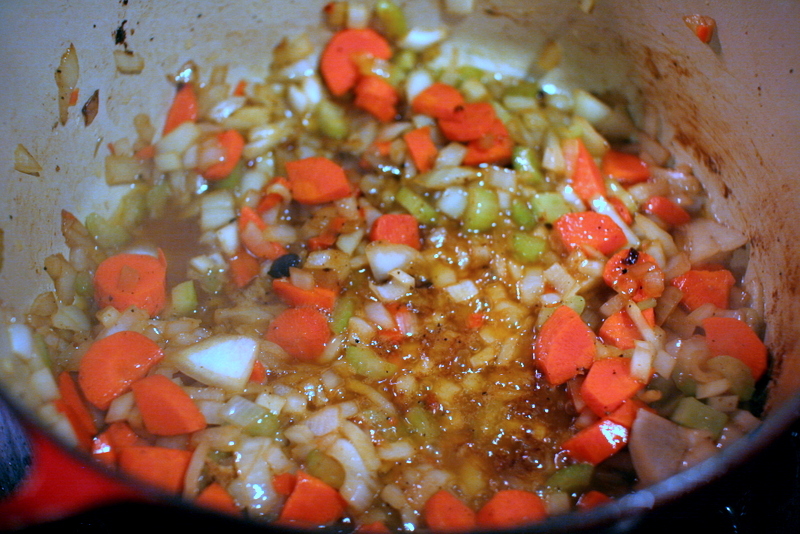 Bring to a boil, then reduce to a simmer. Cover partially. Cook until internal temperature of thickest part of chicken registers 165 degrees, 25 to 30 minutes. 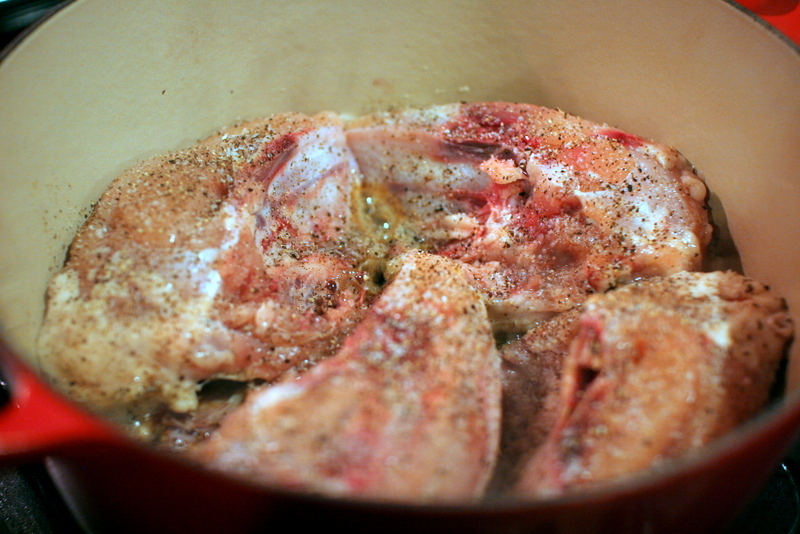 Transfer chicken to a clean plate. Simmer liquid, uncovered, until reduced slightly, about 5 minutes. Discard herbs. 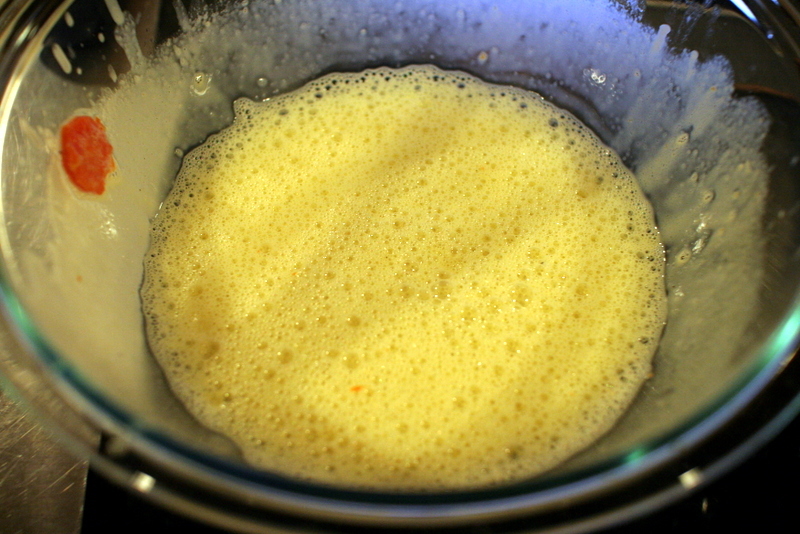 To make the liaison (sauce thickener, this was a brand-new technique for me), whisk together egg yolks and cream in a medium bowl. Whisking constantly, pour 1/2 cup cooking liquid, 1 tablespoon at a time, into liaison to temper it. Stir tempered liaison into pot. 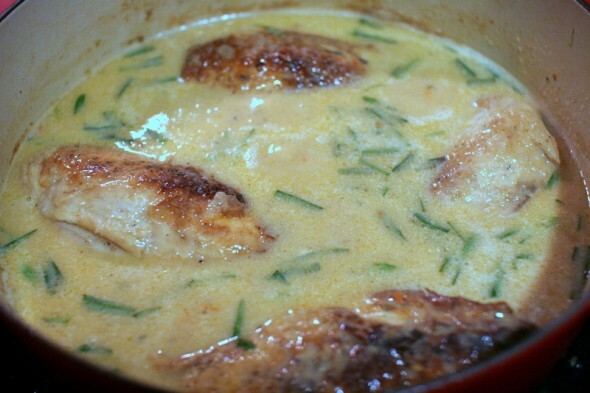 Finish with Tarragon, Lemon, and Butter Return chicken to pot. 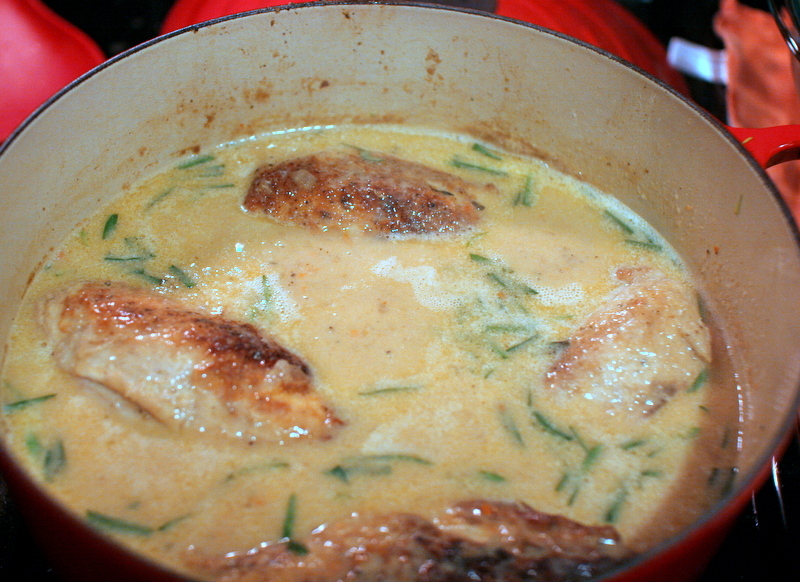 Add tarragon, lemon juice, and the remaining butter. Bring to a simmer, stir gently to combine, and serve. Feel instantly rescued from Seasonal Affective Disorder. So really the only difference is no mushrooms and breasts instead of whole chicken, right. Looks divine. 1 big onion or a handful of shallots. – big onion cut into large chunks. Do not bother to peel onions or garlic or shallots. 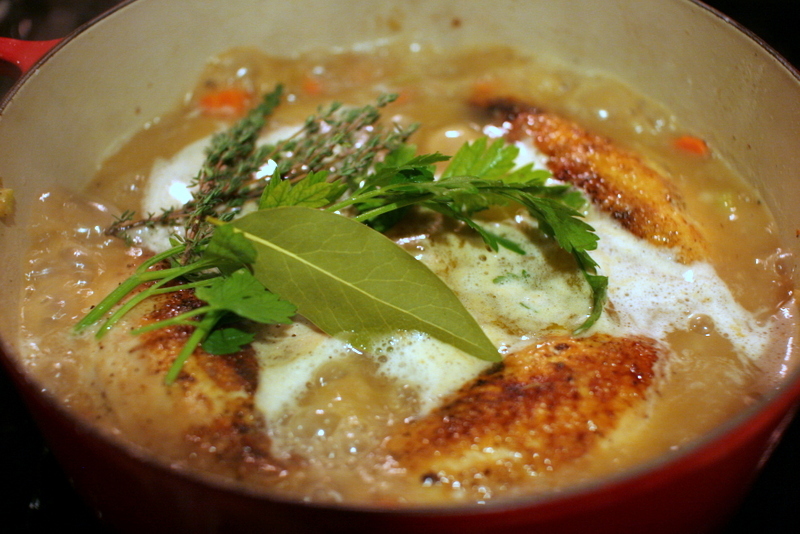 Put all the parsley in the bottom of a pan just a bit bigger than chicken. 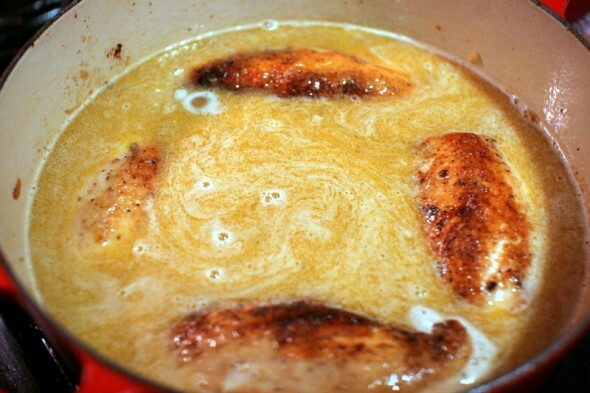 Dot with butter or olive oil, Ll other ingredients, and if you have a neck and extra chicken fat, throw it in for flavor. 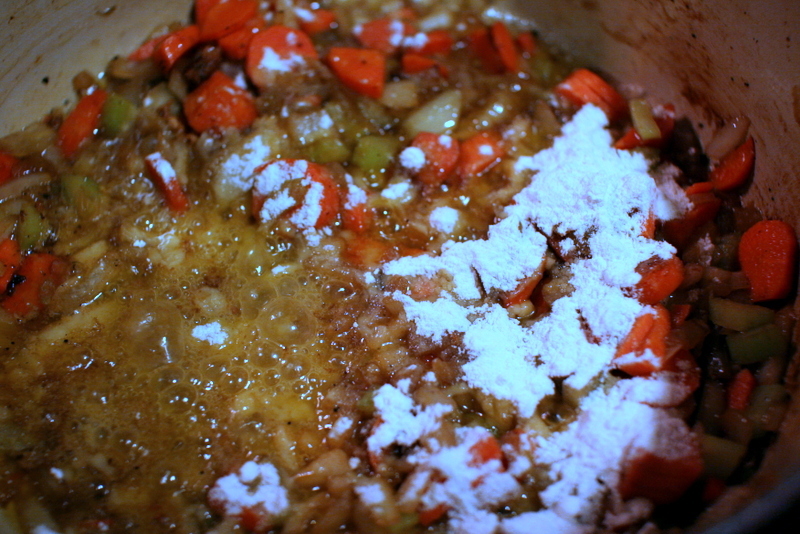 Spread the chicken on top, pour melted butter on top and salt liberally. Cook 45 mins at 375 or until top is nicely crispy and juices run clear. Eat, especially the parsley which will have turned into the MOST delicious veggie. You can add carrots Nd potatoes, but I never do and usually serve with mashed potatoes.